I’m behind. As a result, I think I’m panicking a bit. It’s the beginning of December in a couple of days from now, and I feel like my winter training has only just begun. There’s a reason for that. It has. My regular reader will remember that I went off-grid for almost all of September and October. My 2011 racing season actually came good while I was away, but the European Masters Games track in Lignano really did for my achilles tendons. Several other athletes report the same thing. It was like concrete, and no was suitable for a major event like that. I learned a lot about collagen. Specifically, how slowly it repairs. 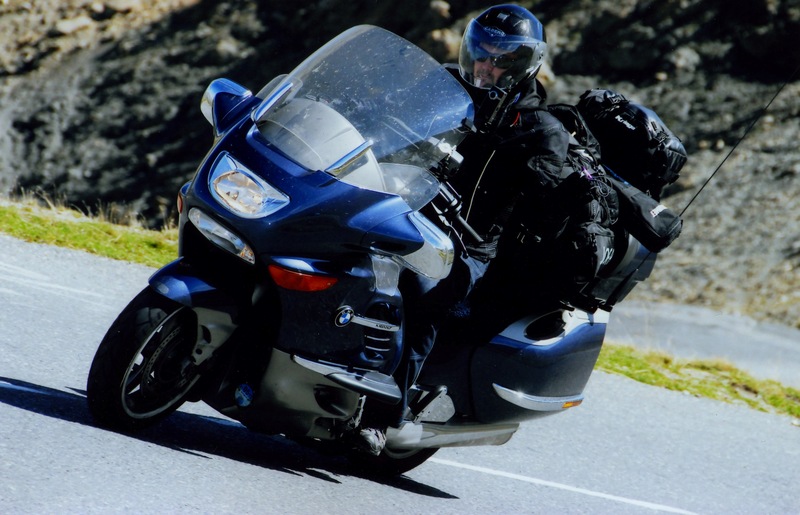 And I guess that the month I spent after the EMG, riding my motorbike and lugging cameras around the mountains didn’t really serve as recovery time. Consequently, by the time I’d returned home, settled back into my new routine enough to start training again, and begun working hard enough to make a difference but not hurt my heels any further, I’m imagining that most of those I will race against next season were much further into their stride, as it were. New routine? Yeah, now that I’m not working, except in a voluntary capacity, I have time on my hands, in theory. I wish it felt like it at the moment, though. What I am managing to do is to keep to my training routine pretty well. Gone are the days when the demands of a full time job meant skipped or skimped sessions, days lost from being just too damned worn out, physically or mentally, to be able to bother, and so on. I never did kid myself, however, that, having left work (I can’t bring myself to use the word “retired”) I’d be able to train every day, crank out great big long sessions, and all that stuff. Currently, I’m content with being able to relax a bit before taking on a session, being able to do the session at a decent pace and quality, and in full, and then to be able to rest up properly afterwards. As I reminded someone recently, It isn’t actually the training that gets you fit, it’s the process of adaptation that takes place after each training session. As a runner, I need to confess something unusual. I actually hate running. Let me qualify that. I actually hate running any great distance, and I loathe cross-country running with a deep and lifelong hatred! I’ve done my share of both. I had a spell in my 30s when a long-term injury prevented any sort of sprinting and sprint training. I regularly ran 10ks and half marathons. And hated it. I’d hoped to add a photo of me suffering in a half marathon in 1986. I’ve mislaid it for now. It’ll turn up. Without divulging secrets, most of my training currently revolves around a core of strength, agility, and leg-speed training. I do the boring stuff, like stamina and cardio work, of course. I wish I could bring myself to enjoy it, though. I’m happy enough to enjoy my own company while training, and not to be bothered by how good (or bad) a session companions might be having. I’m also imaginative enough to devise sufficient variety in my routines to stop me getting stale, and I’m good at stealing great ideas from other people. Perversely, living more than 20 miles away from the nearest decent track, and within walking distance of my gym, means that I never have the excuse of bad weather to avoid doing some sort of decent session, too. Two “By the way” bits to close: in keeping with tradition, the title of this blog is a song title. By the wonderful Martin Carthy.) And the first draft of the web site covering the big Dolomites project mentioned back before my Big Adventure is now on line. You can find it here. A number of years ago, I was teaching work colleagues stuff about internet search techniques. A good game is to put your own name in and see what comes up. I had done this before, and had been amused to have a crazy Texan judge, a well-known modern artist, a WW2 Admiral and the originator of the Bushmills Distillery (!) as namesakes. But I had never noticed the entry for the Commonwealth WarGraves Commission which listed where to find the gravestone of a soldier with my name, killed in France in 1916. I still can’t remember what led me to go back to the CWGC site later that day and enter my name, plus some simple variations on it (Thomas, rather than Tom, for example). However, I can vividly recall the impact on me from finding that, all told, the list came to something like 54 entries. Let’s be precise: that’s 54 graves, just in northern France or Belgian Flanders, all from between 1914 and 1918. Suddenly the sheer scale of the First World War hit me hard. Mine wasn’t a name like Smith, Jones, or Brown. Mine’s a common enough surname, particularly in parts of Northern Ireland, where my late father’s family are from, but by coupling it with my first names, I expected to find maybe two or three entries. Not 54. 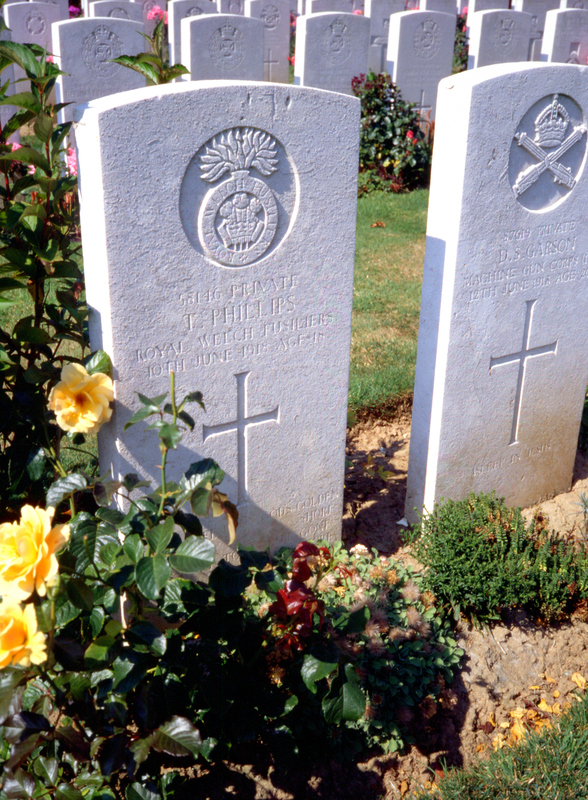 I have three first names (a family tradition) and there were even CWGC entries for soldiers with the same initials. I was also pretty sure that none of the entries related to direct relatives. My admittedly pretty thin understanding of my family history is that they were involved in what came to be known as “reserved employment”. I’d travelled around France and Belgium a lot. I’d admired how beautifully situated and perfectly tended the CWGC cemeteries were, and read lots about the War, including the excellent Lyn MacDonald books. I’d never made a connection with it all at a personal level, though. Reader, that may be your position too. Try the search engine thing. You never know where it might take you. Now, of course, I couldn’t just let it go at that. It was midwinter, but I began plotting a series of visits in the spring and summer to visit, photograph and pay my respects to each of my namesakes’ graves or memorials. It’s something I’ve completed now, and I’ve visited several more than once. 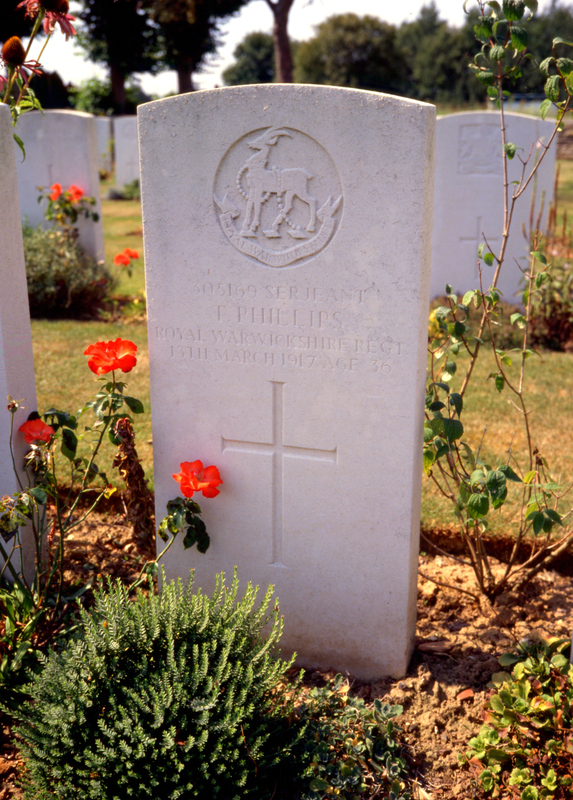 This little project probably reached it’s emotional climax at the little Asservilliers cemetery on the Somme. 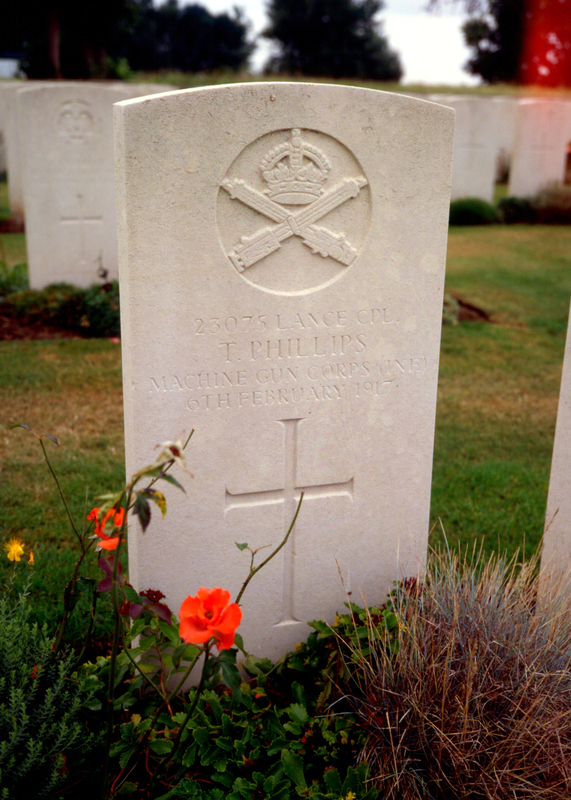 Nowadays this small graveyard sits right next to the A26 motorway and the TGV line, but it is home in perpetuity for two dead soldiers named T.Phillips. Astonishingly, it is the last repose of an uncle of someone I know, too. I can never forget the emotion of seeing my own name on a gravestone. My first was at Busigny, deep in rural Picardy. I’d expected it would feel a bit like the Ghost of Christmas Yet To Come showing Scrooge his own headstone, but it was far more visceral than that. This was later compounded when I realised that I was visiting the graves only of the namesakes who had died. There would have been others who survived, intact or wounded, physically or mentally scarred, and all forever changed by their experiences. And suddenly I understood how huge this thing called mechanised war really is, how it destroys families, villages, regiments and so on. Maybe we’re not learning the lessons, but thank you, Commonwealth War Graves Commission, for helping remind us. You are currently browsing the Blog from a Faster Master blog archives for November, 2011.